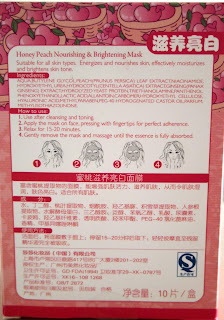 Women all over Asia swear by their nightly face mask ritual to keep their skin looking fresh and young. 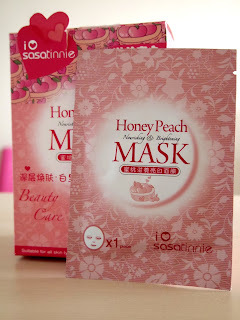 I've tried out SASAtinne's Honey Peach for nourishing and brightening. 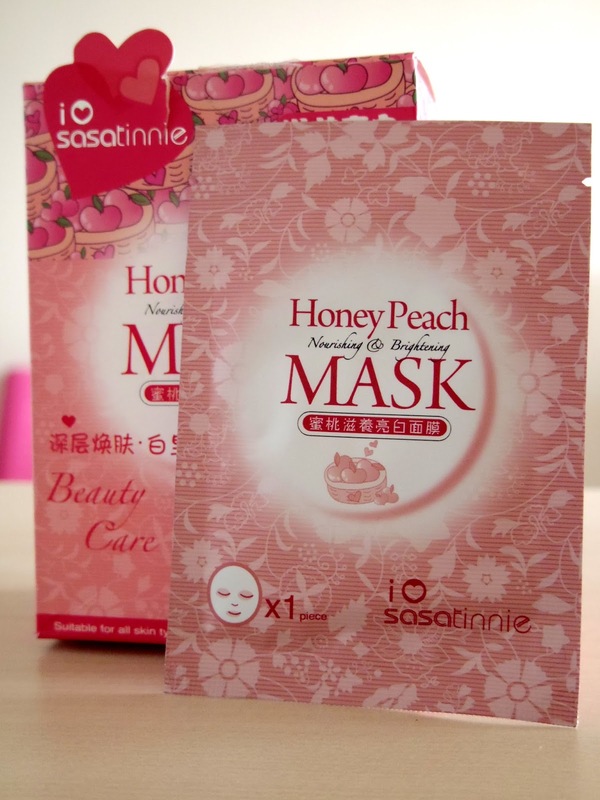 i<3sasatinnie Honey Peach MASK comes in a box of 10 and claims to energize and nourish the skin while moisturizing and brightening. After wearing the mask for 15-20 minutes, the cotton becomes dehydrated as your skin absorbs the emulsion. Immediately after removing the mask I did notice a bit of sticky residue is left behind even after massaging it in. This however will go away after your face is completely dry. 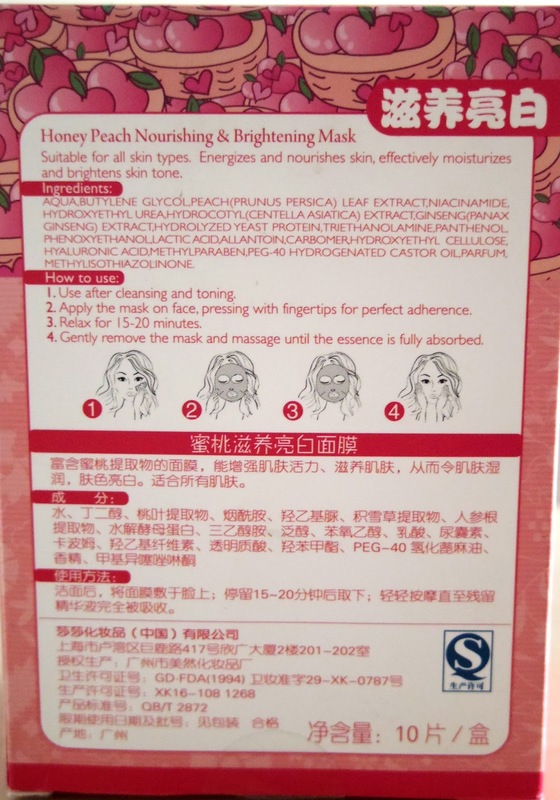 I typically applied these masks after exiting the shower at night and noticed my skin was much more plump and firm than had I not used the mask. I used these masks as my quick go to spa treatment the night before an event where I wanted my face to look its' best. Had I used these masks daily I question whether or not my skin's texture would have actually improved or would it have been given the appearance of improvement due to the awesome next day results. The only thing that might prevent me from purchasing these again is the scent. I had hoped for a sweet and feminine honey and peach scent, but instead was met with an artificial almost sour smell. Amberette smooth BB cream is my current favorite BB cream. It's lightweight formula does not leave any inkling of shine or grease after application and so far has been one of the only products that works to cover up my large pores and give me a smooth complexion. I have only seen one color option for this product, but it fits my skin tone so there's no problem there. I really like that it doesn't have any pink tones in it and instead uses a bit of yellow which helps combat any redness. 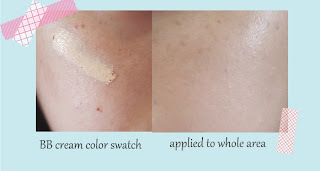 As far as coverage, it is a BB cream so you can't expect the same coverage as a foundation, but I'd say it covers better than drugstore brands available on the US market (Garnier, Revlon). This product comes in a 50ml bottle which has lasted me a surprisingly long time (4+months of daily use!) I will definitely purchase this product again. 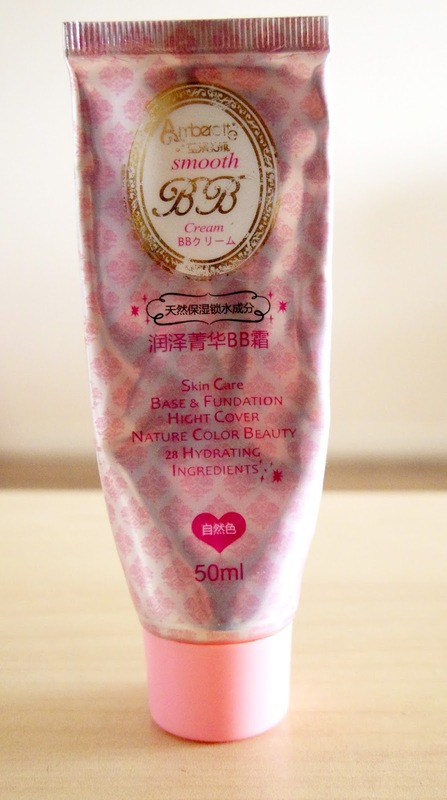 I can't seem to find this information on the website, but Amberette smooth BB cream can be purchased in stores at Sasa.